Bartlett Woods had a secret admirer today that left May Day Baskets for everyone and they were beautiful! The baskets were received as folks came down to breakfast and the day was full of smiles, memories, and happiness. Everyone had a story to tell about the May Day’s they had experienced as a child. The stories were told as if they had just happened and were fascinating. They were told with so much excitement. This was all due to a small little basket made from wallpaper scraps, paper flowers, and candy. Someone saw a May Basket and wished his wife a Happy Birthday because he remembered the two days were one and the same. Speaking as a nurse, there isn’t a pill that can bring this much joy to the faces that I witnessed today. Everyone had a good day, today……. What are you doing next May 1st? But, shhh, don’t tell the commercial marketing companies. Let’s keep it traditionally quaint. May Baskets were made and delivered by Barbara Moores. Barbara works in our dietary department. Thank you, Barbara! 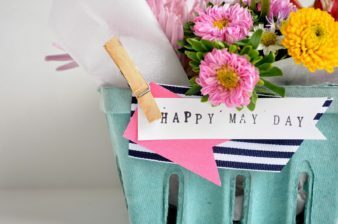 May Day was also celebrated by some early European settlers of the American continent. In some parts of the United States, May baskets are made. These are small baskets usually filled with flowers or treats and left at someone’s doorstep. The giver rings the bell and runs away. Through the 19th and 20th centuries, May Basket Day celebrations took place all across the nation. Writing in the Humboldt, Iowa, Independent in May 1976, the local extension home economist reminisced: “What a gallant occasion Mother made of May baskets. Lists were made and rewritten. It became almost as exciting as Christmas.” Her family used old milk cartons for containers and they made popcorn and Boston cremes for each basket. People in her community returned May baskets to their owners at Halloween. The Taunton, Mass., Gazette in May 1889 told the story of a young man who got up very early and walked a mile and a half to hang a basket on his sweetheart’s door, only to find another basket from another beau already hanging there. Eventually, May Basket Day — like the spring flowers arranged in the baskets — began to wilt and droop. Though vestiges of the sincere ceremony still pop up on the Internet, the in-real-life event has pretty much evanesced.